With a special skill and sharpened intuition, you can enjoy the best part of science. In the case of Tycho Brahe (1546 – 1601), the skill came from his extraordinary eyesight. On November 11th, 1572, Tycho found a very bright star in the sky, a newborn supernova known now as SN 1572. Through careful studies with his naked eyes, he proved that it was a fixed star in the stellar sphere beyond the Moon even beyond all the planets, and thus refuted the Aristotelian belief in an unchanging celestial realm. 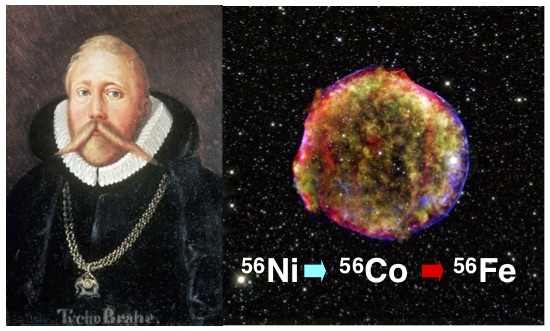 Modern astronomers found the remnant of Tycho's star in the 1950s, and the light echo analysis 400 years after the explosion showed that SN 1572 was a Type Ia supernova, where carbon and oxygen fused into heavier elements within a period of a few seconds. This is how iron was produced by radioactive decay of 56Ni through 56Co to 56Fe. Iron is thus the most stable and abundant heavy element in the universe. In April 2006, just after Dr. Masaharu Nakamura moved out of my group to Kyoto University, I was reading a research report of an undergraduate working of an iron-catalyzed cross coupling reaction. One product struck my eyes, 2-biphenylpyridine formed in 8 % yield in the reaction between 2-bromopyridine and a phenylzinc reagent. Obviously, catalytic C—H bond activation took place apparently without any oxidant involved! I was much intrigued by this side product, but not the student who made this precious discovery. Dr. Jakob Norinder from the Bäckvall lab eagerly shared my excitement, yet he could not get this side product. Together with Dr. Naohiko Yoshikai now in Singapore, he found after a few months that we need molecular oxygen and 2,2'-bipyridine, another side product. Clearly, we needed an undergraduate technique, not a post doc skill for the new discovery! It took us another year to identify 1,2-dichloro-2-methylpropane as the best oxidant among numerous oxidants examined by Mr. Arimasa Matsumoto now in Nara. Ten years after this first publication in 2008, we have reached the second stage of our study on the C—H activation -- "homocoupling-free iron-catalysed twofold C–H activation/cross-couplings of aromatics "(The paper could be found in AOP of Nature Catalysis, https://www.nature.com/articles/s41929-019-0245-3). In July of 2017, we published a review on iron-catalysis, and it has been cited over 180 times already. The iron-catalysed C—H activation is now an established field of chemistry.